Journaling at a camp in N. California. Here is the second and final part of my guest post on pctnews.com. This is a follow up to the first post, Getting Wired on the Trail. It is titled, Being Wired on the Trail. 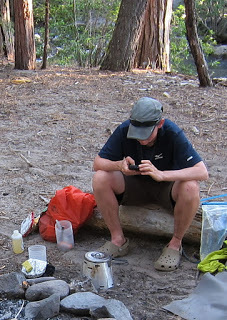 Again, thanks to Halfmile for inviting me to write on his blog, and for everything he does for the Pacific Crest Trail!